Messy hands? No problem on KitchenPC! Back in January, I was approached by a company called Nuiti Labs who is the maker of a popular Firefox plugin called Firesay. Firesay enables users to control their web browser with their voice just by saying things such as “Open Tab” or “Go To Facebook.” While these sorts of things have been around as far back as I can remember (yeesh, I think they had these programs for Windows 3.1! ), they’ve never really seemed to catch on. I suppose people are just too used to using a mouse or keyboard to interact with computers. However, suppose there was a scenario where it really did make more sense to use voice controlled technology; that’s what Ehud Halberstam from Nuiti wanted to talk with me about over coffee in Kirkland one afternoon. This Israeli-based company was hard at work on their next version of Firesay, which would support the Google Chrome web-browser. This product “spin-off” would be branded as “Firesay In-Page” and was no longer a plugin just to control the browser, but was an entire API that allowed the website itself to harness this technology. Web sites could now provide a whole new experience to their users by offering voice controlled functionality and text-to-speech feedback. Ehud was quite interested in exploring the possibilities of kitchen related scenarios, and stumbled across KitchenPC during his investigation. A partnership was definitely mutually beneficial. Nuiti would have a great recipe site to showcase their product, providing a real use case and not just theoretical examples for marketing purposes. KitchenPC would get to “ride their PR wave” and hopefully get a flood of traffic through their product launch. Though “people who install browser plugins” is hardly my target demographic, I figured I’d at least get some of the techie chef crowd interested. We spent the last couple months working on the required KitchenPC changes, and I’m happy to finally be able to announce today the launch of a Firesay enabled KitchenPC! The Firesay enabled KitchenPC experience is quite simple. 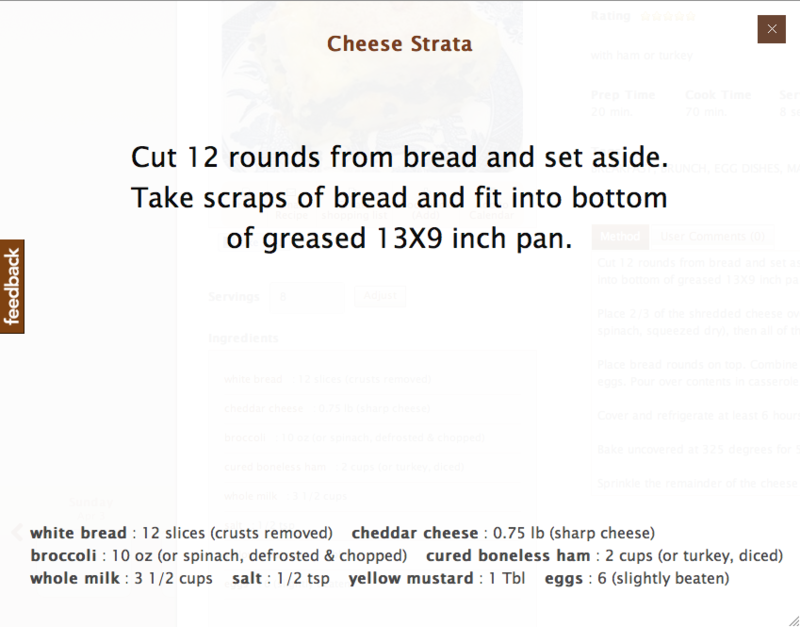 Once you have the browser plugin installed, you can load any recipe on the site. You’ll now notice a little Firesay command widget at the bottom of the screen whenever Firesay is listening for commands. It’ll display a list of available commands for whatever context you’re in. While in the recipe viewer, you can say “Firesay, Start Cooking.” KitchenPC will then shift into a “full screen” theater mode that is optimized for kitchen use. Only the information you need is displayed, and the fonts are huge so you can read the screen from ten feet away or so. KitchenPC is able to break down recipes into steps automatically, and the first step is displayed on the screen and read out loud using a synthesized voice. The user can say “Firesay, Next Step” to advance to the next step, or “Firesay, Repeat Step” if they miss something and don’t want to have to glance up at the screen. I’ve done a lot of testing and the voice commands actually work surprisingly well! I can be anywhere in the room and still have great results. In fact, one time I stepped out of the room into the hallway and it still worked. What I most like about this partnership is this is the first feature (hopefully of many to come) that really starts to target my initial vision of bringing the power of the personal computer into the kitchen. Though not many users have PCs set up in the kitchen, hopefully this sort of innovation will start to change that. For now, I can see this feature being used on laptops and tablets while cooks are busy chopping up onions or searing steak. According to Ehud, there will soon be versions of Firesay that run on iPhones and iPads too. You can learn more about hands-free operation on KitchenPC by clicking here. I’d love to hear your opinions on this feature, or any ideas on how I can make it more useful as well!